We’re fast approaching the August Bank Holiday and if you’ve been in the area for a while you’ll know that Crowborough Hospital will be hosting it’s annual Bank Holiday Fête, organised by the Friends of Crowborough Hospital. It’s one of those things that we always remember during the August Bank Holiday but seem to forget throughout the rest of the year – the Friends of Crowborough Hospital Shop – which is on site and is open Mondays to Fridays from 10am until 4pm. The shop was started by volunteer members of FOCH in the late 1990s to give patients, staff and visitors alike somewhere to purchase items such as gifts, snacks and toiletries or their way in or out of the hospital, whether working, volunteering or visiting. Some items are donated such as the knitted baby clothing and tea cosies (hand made by a supporter of FOCH), toys, books and a selection of local produce from fresh eggs and honey to jam and cakes. Other stock is brought in especially, such as the toiletries. It’s location makes it simple to find when you’re visiting the hospital, it’s in the foyer on your way into the building so you don’t have far to go once you’re on the grounds. 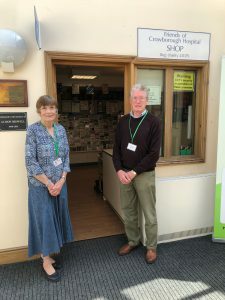 It’s such a simple way to support the Friends of Crowborough Hospital as all profits generated from the shop go straight towards the benefit of the hospital. FOCH are keen to remind everyone that the shop is there for some of the essential items you might need and just by making a few purchases from the shop regularly will help ensure it’s survival. It’s a phrase we hear all too often these days, ‘use it, or lose it’. There are currently 40 volunteers who manage and run the shop and they love having customers as it makes their time in the shop much more enjoyable. FOCH are always happy to listen to your suggestions, so if you have any ideas on potential stock, or would like to volunteer, please do get in touch with them. So, the next time you’re looking for a gift or card or even a new plant for your patio, pop along to the Friends of Crowborough Hospital Shop and you’ll be pleasantly surprised. It’s not just open on hospital fête day but throughout the rest of the year too!